Music with a fraught past is frequently performed, but how should it be presented? Is it correct to say that all fraught pasts are equal - e.g., Beethoven's or Mahler's personal experiences as opposed to Klein's experience in a concentration camp? Reflecting upon recitals of works that depend on the audience's knowledge of historical contexts, we may legitimately wonder whether such events offer something more like a history lesson than a musical experience. Jumping back and forth between history and aesthetics is a common practice, but are the two worlds mutually exclusive, or can they coexist to create powerful experiences? And if they can, in what way? Must programs that in some way engage the fraught past be entirely devoted to a particular time, place and condition, or are there more subtle ways to program? All of these issues were on display at the recent symposium, How Should We Perform the Troubled Past? A Weekend of Concerts and Conversation, at the Colburn School in Los Angeles on October 8 and 9, 2016.1 A series of panel discussions, scholarly papers and performances raised issues on topics that ranged from music in the camps to legal issues of appropriation and recovery, and from Beethoven, Wagner, Schoenberg and Shostakovich to questions of concert programming. Of particular note on the latter front was the Saturday night concert put together by Robert Elias and Mirjam Frank and curated by Frank, a mezzo-soprano who is also a doctoral student at Royal Holloway, University of London; students from the Colburn Conservatory had been recruited to play chamber works by Erwin Schulhoff and Gideon Klein. At first, Elias and Frank had imagined a straightforward, two-part program: a vocal recital followed by two chamber works for strings. But Frank had other ideas, and the final result was an intricately designed presentation that intertwined the instrumental with the vocal. There are, of course, many possible ways to organize musical presentations. The most common one, in terms of pedigree and prestige, usually involves programs that have an obvious inner coherence: the string quartets of Beethoven; a lieder recital that proceeds chronologically; an orchestral concert with an overture, a concerto and a major symphonic work; songs about springtime. At the opposite end of the spectrum, at least in our time, there are more vaudevillian approaches to a concert as a series of unconnected acts. While such events were the norm in many places throughout the nineteenth century (Mme Richard will sing an aria from the Magic Flute, followed by a bravura piano improvisation by Monsieur Thurnbottle on a theme from Fidelio, and the evening will conclude with a twelve-hand, six piano arrangement of von Suppé's Light Cavalry Overture), they are rarer today. 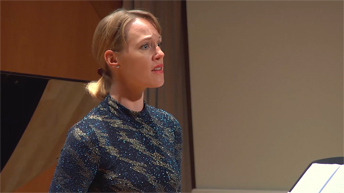 The very idea of interpolating two chamber works within the context of a vocal recital raises questions: Why do we program as we do? And what, in fact, does a concert or a composition actually mean? But there was something else as well. By combining songs written in Terezín with compositions by Beethoven, Mahler, Zemlinsky and others, Frank challenged those memorializing programs that invite audiences to go back to those times and empathize with composers, contemporary audiences and all the victims of the period in question. Frank's views, stated simply and powerfully in a recent article,2 can be summed up in the following words: A re-enactment of Terezín cannot be in anybody's interest. In keeping with her approach, this concert program juxtaposed works from Terezín with other repertoire choices in a way that highlighted tensions, created dissonances and suggested multiple ways of telling both historical and aesthetic stories. It is no secret that, for the most part, writers of history have chosen a linear approach: events follow each other rather than moving backward; chapters tend to move in chronological order or to be organized by subject matter. Although the linearity may be interrupted by footnotes, it is also enhanced by them, as the forward motion is given even more weight. Whether we acknowledge this practice's imperfections and recompose the past according to other models, or whether we consider this process to be inherently false, this is the primary way in which we encounter the past as it has been written down. Concerts are entirely different creatures. Even if they are presented within a historical context, they have an immediacy and a protocol that separate them completely from written history. Yet, even though concerts are not discourses on history, programs such as this one can suggest ways of thinking about the past that are more subtle than most historical writing. Even the first three short pieces on the program raised myriad questions about the past: The beautiful lullaby, Adio querida, a song textually linked to the Golden Age of Spanish Jewry, was sandwiched between two Terezín songs attributed to Ilse Weber. Although many of the seemingly infinite recordings of this lullaby, on YouTube and elsewhere, endeavor to forge a fantastical, late medieval Sephardic sound world, the melody was almost certainly a creation of the late nineteenth or early twentieth century, and may even be based on Verdi's Addio del passato from La Traviata (although there are those who believe that Verdi was the borrower). And although the combination of slowness, the lover's farewell and the minor-sixth tone of the piece can, and has been, tied to the theme of Jewish loss related not only to Spain, but also to the Holocaustthis kind of appropriation is as subjective as it is arbitrary. (This leads to a paradox: if a person writes a farewell song and is killed immediately afterward by a piano falling through the floor of the apartment above, it cannot be said that the farewell song was a personal one anticipating the piano's fall, yet it is natural for listeners who know the story to link the two events and to hear the farewell song as a personal adiós). This ambiguity is mirrored in the two songs by Ilse Weber that surround Adio Querida - Ich wandre durch Theresienstadt and Wiegala - both of which raise related but different questions. For neither song is there an authoritative text. We have several versions of Ich wandre durch Theresienstadt, but none can be attributed to Ilse Weber herself; and to further complicate the matter, the song's two arrangements, as Frank notes, are radically different from each other: one is sentimental, the other ironic. The lullaby Wiegala is even more difficult to interpret: it has an unattributed back-story that links it to the gas chambers, and only a text and a melody exist in Ilse's hand. No tempo, harmony or accentuation is given. Extant versions vary in tempo, texture and even meter. Wiegala seems to be whatever we make of it, and, once again, this can be either an invitation to careful thought or a vehicle for a variety of self-fulfilling prophecies about Terezín and the camps. These three songs are often used to comment upon the past, to suggest associations, even to make assertions. But can they deliver on this score? Or do the historical lessons we learn from them involve that key tension between engagement and reflection? Sometimes, even as we immerse ourselves in such beautiful and interesting songs, our desire to learn more about them forces us to ask other questions, most of which have to do with how willing we are to delude ourselves about what happened, or our inability to grasp it fully. Earlier in the symposium, in a lecture-recital, Frank had demonstrated how different realizations of the limited materials relating to the songs of Ilse Weber create different world-views about the place where she was interned. This fact also reminds us that there is no single Terezín experience, and that even if such an experience had existed, no single piece of music could depict it. The approach outlined here might seem to imply that any relationship between aesthetic engagement and historical speculation is potentially disruptive to either or both. But this need not be the case. We have neither the words nor the broader capacity to understand the rich processes that take place when we go to a concert. Unlike a play or an opera, in which at least part of our thinking is harnessed by a story line, a concert program allows for a kind of thinking that is simultaneously somewhat directed and completely free. Yet there are obvious problems in certain repertoires. In this case, the specific issue is the awesome power of the Holocaust, which can almost automatically become the center of gravity whenever material within its orbit is performed. Consider the third of Zemlinsky's American songs performed on this concert - the exquisite, Love, I Must Say Goodbye. Does this desperately sad song become a farewell gesture that soundtracks the Terezín experience when it is performed alongside the work of Ilse Weber? We cannot say for sure, but we might agree that in today's concert atmosphere, it is far more likely for Zemlinsky to be pulled into the Terezín orbit than for the Terezín songs to be heard as mere romantic goodbyes, owing to their proximity to Zemlinsky's work. And yet there is no reason why this should be so; the power of a concert depends, once again, on the most sensitive interplay among its components, none of which can be proscribed. We can explore this question in greater detail by examining the felicitous pairing of Gideon Klein's Lullaby with his Trio for Strings. The former was written in the early winter of 1943; the composer still had almost two more years to live; he had been interned in Terezín for just over a year, probably knew nothing about the death camps in Poland and was a key figure in Terezín's musical life. Not that he knew nothing about death—it is possible that the lullaby was a response to the typhus epidemic that raged through the camp during February of that year; but he was probably not aware of Auschwitz. How different were the circumstances under which the Trio was conceived and completed! Begun in August 1944, it was finished during the fall transports that emptied the camp of a large majority of its long-term prisoners. We can never know precisely what Klein knew about what awaited him, but there is an extremely good chance that by that summer he was aware of the death camps. Thus he probably knew where he was headed, and he would likely have tried to incorporate some of his responses into the Trio, in the form of hidden elements such as symbolic song texts, quotations from other works, and references to a funeral march. It is difficult enough, not to say almost impossible, for even the most serious and careful scholar to calibrate the differences between these two works in relation to Klein's ultimate fate and the larger questions surrounding it, and it is certainly impossible to figure out how a performance of either work can or should reflect in any way the realities on the ground at the time of composition. And yet, linking them is a meaningful gesture. Even if two pieces of this sort were grouped together only on the basis of historical continuity, their juxtaposition would still create aesthetic moments that transcend such things. The lullaby, as Klein understood it, was a Hebrew folk song that seems to foreshadow some of the character of the Trio's second movement. Of course the battle for and about musical meaning has been going on for centuries. For some, music is nothing more or less than the relationship between tones in musical space, gloriously abstract and preferably untainted by too much contact with other aspects of reality. Others insist on a general connection between human states of mind and behavior and musical gestures, while still others wish to forge closer connections, arguing, as did Mendelssohn, that music is actually the most precise commentary on human existence. Finally, in Terezín artists and musicians also used music as a means for sending messages that exposed the propaganda lie of the camp. Mirjam Frank is a musician-scholar who, although keenly engaged with historical issues in various aspects of her work, has a horror of imposing them on the music she performs, and she is especially skeptical of basking in the hot emotions related to specific, fraught events of the past. Thus her work and her compelling performance style are artistic rather than didactic: she makes nuanced suggestions about connections between musical, textual and historical substances without ever forcing them, and she ensures, as far as possible, that the pieces on the program inform each other rather than having a memorializing center of gravity. We see this in her arch choice of Thomas Traill's My Love's in Germanie, composed in 1794. Seen from one angle, this lovely lament may be drawn into the orbit of Ilse Weber's Wiegala, but from another, under its impact, Wiegala becomes a simple lullaby whose power does not depend on its Terezín setting. The same process obtains in the final two songs: ending the program with Mahler's Wo die schönen Trompeten blasen and Beethoven's In questa tomba oscura neither straitjackets these two composers within the world of Recovered Voices nor forces the Terezín songs out of their context. Yet the songs do address each other. One of the main points of instrumental music and of non-dramatic vocal music is that there is no straightforward plot or narrative. Thus listeners are at liberty to avoid narratives altogether or to create their own nuanced plots, if they wish. Although an artfully crafted program, such as the one under discussion, in no way interferes with this freedom, it also has the capacity to open up varied, thoughtful and profound approaches to sound and history. To see the concert program from the event, click here. Michael Beckerman is Carroll and Milton Petrie Professor of Music at New York University and is currently the Leonard Bernstein Scholar-in-Residence at the New York Philharmonic. He was a co-organizer of the symposium in which the referenced concert took place and is the author of a series of books and articles on topics related to the event.